Overlooked in this dismissal of Varadero as “not real Cuba” is the fact that Varadero has always served and hosted foreigners. Five centuries ago it was a place where Cubans extracted salt from a nearby lagoon and loaded it, along with cattle, onto Spanish ships bound for Mexico or Spain. Soil on the 23-km-long peninsula is poor but a few ranchers found it convenient to run cattle there, and likewise convenient to build haciendas on the peninsula’s exceptionally beautiful beach. It is not much of a stretch to surmise that those first Varadero residents occasionally invited Spaniards from the ships they were supplying to come ashore for a little R&R. Over the next 300 years, that core of local service providers evolved into a village known as Varadero. 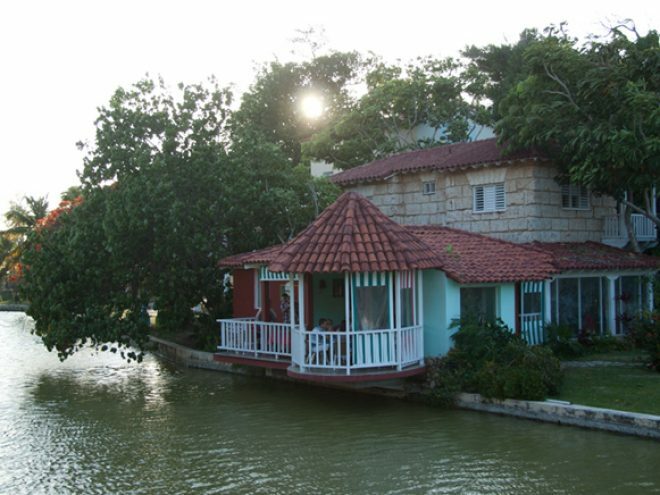 Some built large wooden houses, and when a railway was laid from Havana to Matanzas in the early 1800s, those big wooden houses, or rooms in them, were often rented to Cubans on holiday. Habaneros reached Varadero by traveling the 100 kilometers to Matanzas on the train and covering the remaining 40 kilometres by horseback or buggy. Visitors from other parts of the island came by steamboat, the Caridad, across the bay of Cárdenas. This was the nature of Varadero’s main industry (tourism) for about a hundred years. In 1910, the filthy rich Spanish Iturrioz family developed an estate on the grounds of what today is Varadero’s Josone Park. It is said that the patriarch of the family so valued his privacy that he had a tunnel built from his property to the beach about a block away, and when he wished to swim, sent servants ahead to shoo everyone else away. He wanted privacy and so did other wealthy families who bought beach properties in and around Varadero. With at least 20 kilometres of pristine white sand beach, there was room for all of them to have privacy, even after 1931 when someone thought to build a hotel. Cuba’s native bourgeoisie, plus wealthy Americans (who by then controlled most of the island’s resources) continued to vacation in Varadero. Among those who built elegant residences on beachfront properties were Irénée Du Pont who during World War I had earned a fortune by the manufacture of munitions; Al Capone who earned his in a less legal but equally reprehensible way; and Cuba’s dictator Fulgencio Batista, who combined the unsavoury qualities of both those men to acquire his wealth. It was about then that 400-year-old Varadero underwent a 30-year period that could fairly be called “un-Cuban.” Between 1929 and 1959, access was mostly limited to wealthier Cubans (although many middle-class Cubans continued to visit). One of the first things the Castro government did when it took power in 1959 was to open all Cuban beaches to all Cubans. The wealthy fled and their properties were confiscated. Al Capone’s “cottage” became a restaurant. Du Pont’s Spanish Renaissance mansion, Xanadú, became a six-room guest house with restaurant, bar, and adjacent golf course. Batista’s compound, Cuatro Palmas, was first used by the Revolutionary Government to house young people being trained as teachers to be sent into the countryside to eradicate illiteracy and later recycled as a beachfront resort—one of the few right in town. Once again, Varadero had become wholly Cuban. But not for the rich alone because under the new regime there weren’t supposed to be any rich Cubans. Vanguardias Nacionales (model workers) were given government-paid vacations at the Cuban-owned resorts. About the only foreigners one saw in Varadero in those days were a few white-bodied Russian advisors who had driven from Havana in their government-issue Lada. On my first visit to Varadero in 1997, I stayed not in a hotel but in a campismo (Cuba’s version of a campground). That beach, as beautiful as any I have ever seen, swarmed with Cuban teenagers who had been bussed there by their school and were lodged, for free, in little on-the-beach A-frames. I didn’t know it at the time, but my first visit to Varadero was on the cusp of the peninsula’s transformation into yet another aspect of “real Cuba.” Not the Cuba of cane fields and colonial architecture (which Varadero had never been), but a Cuba that in less than a decade would be the most popular resort destination in the Caribbean. At the highest levels of government, that decision had already been taken. To stave off economic collapse after the withdrawal of Soviet support, the nation began promoting recreational tourism. Barely three years after my first visit to Varadero, the campismo where I had stayed was bulldozed to make way for one of many mega-resorts to come. During that transition period, many claimed that Varadero was no longer Cuban, but I never saw it that way. True, fewer Vanguardias Nacionales were given free vacations in Varadero—and almost none to the new out-of-town resorts. Those beds were needed for foreigners who could pay in desperately-needed hard currency. And during that “Special Period,” not many Habaneros could afford to take the bus to Varadero for a day. The public beaches were still there and still used by local residents and their guests, but foreigners often didn’t notice. Visitors who ventured out of their resort only in an air-conditioned tour bus or on a boat excursion could spend two weeks there without meeting a single Cuban who wasn’t on hand to serve them. During the past two decades, the proliferation of mega-resorts has continued. From town out to the tip of the peninsula some 20 kilometers away, surf sounds compete with the clang of construction. These resorts are joint ventures between the Cuban Government and foreign partners. The construction workers are both Cuban and foreign. When the place opens, the staff, including managers, will be Cuban. And the guests? There are no longer policies against Cubans vacationing in the big new resorts. Today only those who can’t afford to stay there are excluded. What this means in practice is that Cubans, being overall less affluent than First Worlders, now fill Varadero’s less expensive hotels, particularly those right in town, while foreigners dominate the pricier places further down the beach. It’s not impossible, nowadays, for visitors to outnumber the locals. But not as outnumbered as a visiting foreigner might suppose. Besides Cuban vacationers and day trippers, there are the local residents. Only Cubans are allowed to own homes, so every property in Varadero not owned by the Cuban Government is owned by a Cuban citizen. This spring I stayed not in a hotel but in a beachfront home owned by a Cuban lifeguard. Was he a new breed of Cuban renting out a room in his house to a traveler looking for a little R&R? Or was he no different from property-owning locals who rented rooms to Habaneros who arrived by horse and buggy 180 years ago? Given that Varadero’s present population of 20,000 is twice what it was in 1990, and there are at least 60 resorts, it is definitely not the sleepy little resort town it was in earlier times. But it was then and is now a vibrant part of “real Cuba.” Cubans work in its restaurants and eat there, too; serve in its shops and shop in them. In the past, commercial enterprises would have been wholly owned by the Cuban Government, but now private enterprise is visible all over town. Many Varadero residents sell arts, crafts, and clothing right from their front yard—or rent the space to others for that purpose. You see few Cubans on the beach in winter, when they consider it too cold for swimming, but go during spring break or summer and you’ll find them there in number. This Easter, while tourists paid extravagant prices to lunch on the terrace of the old Du Pont mansion, I watched what seemed to be happier Cuban families (and certainly livelier ones) picnicking on the palm-shaded grass below and frolicking in the surf. Some, I know, were staying in B&Bs owned by local families. In short, Cubans live, work, and play in Varadero just as they always have. To say that this is not “real Cuba” because it’s main industry is tourism rather than sugar cane is like saying Orlando is not “real Florida” because its economy is based on tourism rather than oranges. Varadero is as Cuban now as it was 200 years ago, when locals provided lodging and other services to beach-hungry transients. Or what it was 80 years ago when the first hotel was built there. And it’s even more Cuban now than it was 60 years ago, when just about all 21 kilometres of the peninsula’s best beaches were the exclusive domain of wealthy foreigners. Just prior to the Revolution, most of the boats one saw in Varadero were foreign-owned. But it wasn’t like that when the town was founded. The word varadero means dry dock where boats are repaired or built, and back then most of the boats belonged to Cuban fishermen. Today the boats one sees at Varadero’s beaches belong to Cuban-owned resorts. Those boats, the men who crew them, and the sand and water moving around them, are as real and as Cuban as you will find anywhere on the island.